The East Gippsland Waterdragons Swimming Club was formed in 2004 following the amalgamation of the Bairnsdale YMCA Swimming Club and the Riviera Swim Club in Lakes Entrance, which was formed following the opening of the Lakes Entrance Aquadome in 1995. 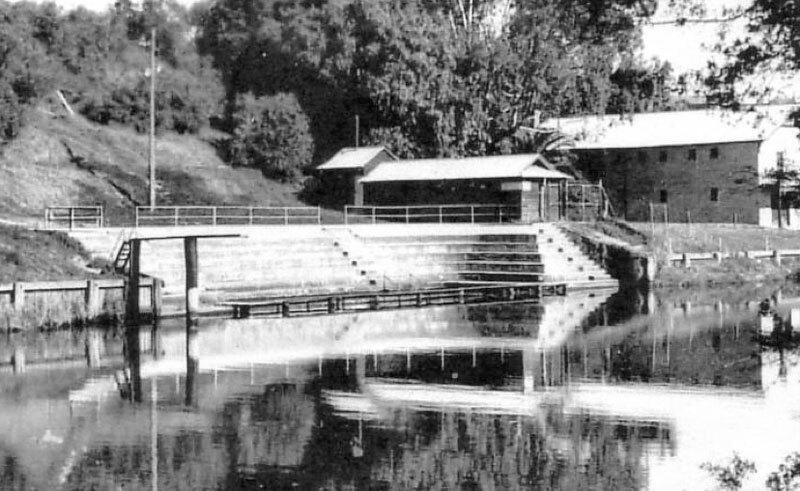 In 1910 Walter Wilson and Fred Eastwood took the job of teaching children to swim at the Old Rowing Sheds on the Mitchell River. This was the prelude of many years of competition between Sale and Bairnsdale. Swimming races were held in conjunction with Rowing Regattas. In the 1920’s, George Matheson and Basil Leask taught many children to swim in the “Dog Hole” in the Mitchell River. Originally this was a pool with a wooden floor and walls in the Mitchell River – this was for the boys. A separate structure fully enclosed was built for the ladies down from the Port of Bairnsdale. Of course they could not swim together! These facilities were poor and the need to provide organised competition encouraged the Council to built “Baths” for the club with “Unemployment /Relief Funds”. 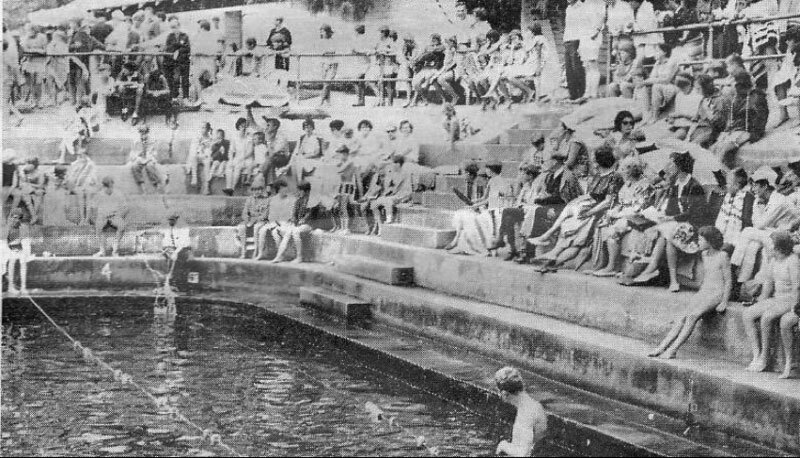 Dressing sheds and Pool were completed in 1931. 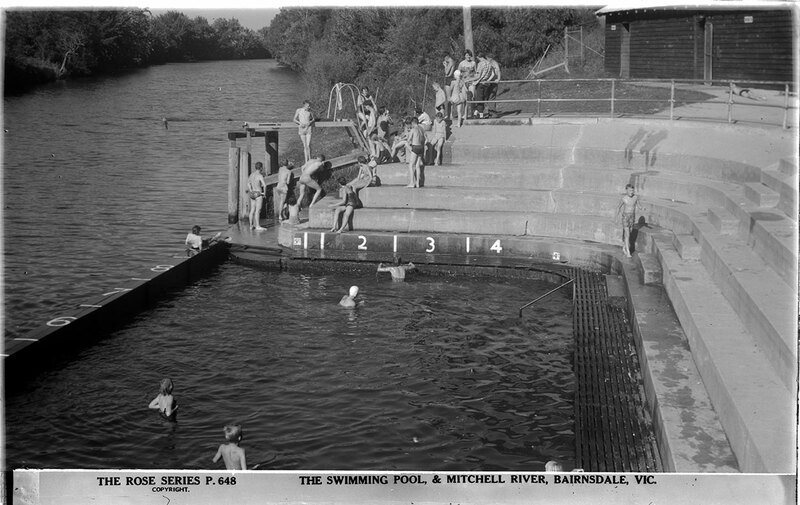 The Bairnsdale Swim Club was formed in the early 1930’s and until 1969 all training sessions and many swim meets were held at the Mitchell River “baths.”. The Bairnsdale Swimming Club was reformed in 1956 after a lapse of a few years and had 360 members by 1957. 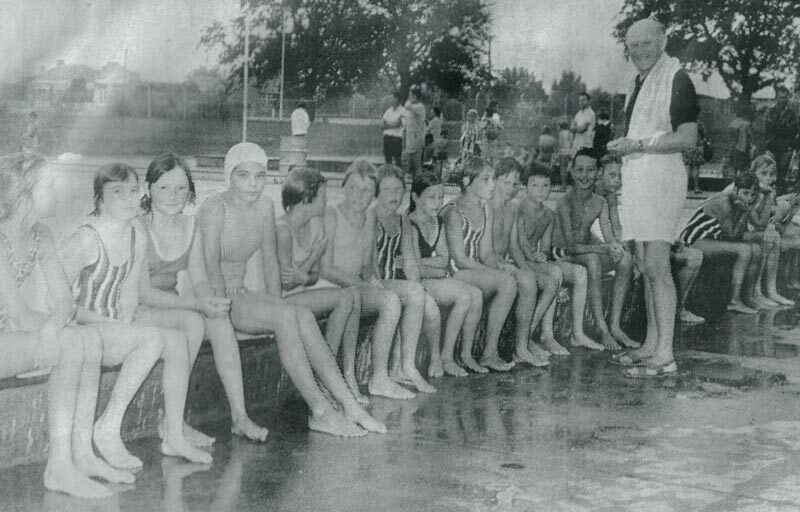 Walter O’Doherty taught hundreds of children to swim, and Bairnsdale played a big part in the establishment of the Gippsland Swimming Association (now Gippsland Swimming Inc). Demand was growing for a new Olympic size swimming pool. The Swim Club worked hard fundraising and lobbying to get a new pool and by 1967 had raised $32,000 towards the project. 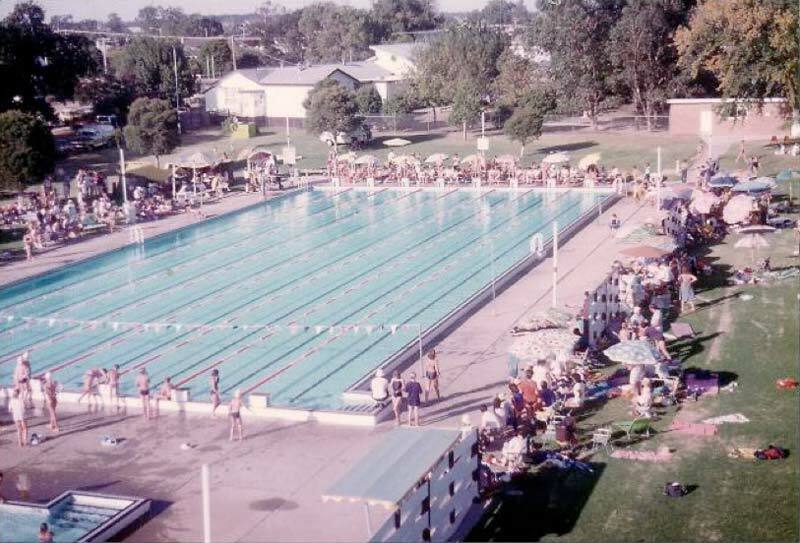 The brand new Bairnsdale Olympic Outdoor pool in Turnbull St was opened on 8th February 1969. The final cost of the pool to Council was $139,200. On 29 April 1995 a new indoor swimming Aquatic centre was opened at Lakes Entrance called the Lakes Aquadome and shortly after Riviera Swim club was formed. On 15 June 1996 a new 25m indoor swimming was built as part of the Bairnsdale Aquatic and Recreation Centre. The Bairnsdale Swim Club changed its name to Bairnsdale YMCA Swim Club and now could train all year round. Both clubs prospered for the next few years but gradually numbers at Lakes declined. In 2003, the decision was made to amalgamate the Riviera Swim Club and the Bairnsdale YMCA Swim Club to become one East Gippsland Club. The name was chosen by a vote at a BBQ to celebrate the union and in 2004 the East Gippsland Waterdragons was born. This is an account recorded in 2008 by Bert Matheson, who coached during the 1960’s and 1970’s, and was the son of George Matheson, who taught kids to swim in the Mitchell River as early as the 1920’s. When Dad first took us down to the Old Dog Hole to teach us to swim, I was eight years of age, the year 1928, he and a chap named Basil Leask took it unto themselves to begin swimming lessons for young blokes. Many parents took advantage of this. Moreover, of a morning, during the season it was the usual thing to see them teaching to the youth of the town, mainly the old dog paddle, and the sidestroke or trudgen, they did not have much expertise, but many kids learnt to survive. At this stage, the old Dog Hole was in an advanced stage of disrepair with some of bottom planks missing but it was still better than trying to learn to swim in the river itself. One father at the time had the rather brutal method of tossing his boys in the river and they had to swim to survive, I think perhaps he had a rope around their waists but I am not too sure about that. Anyway as the years progressed, so did our swimming, but I can remember having to make my first tearful swim across the Dog Hole from corner to corner, but it was also where Basil Leask introduced me to the crawl kick which as history has shown has been the way to go. All top line speed swimmers use it currently. When the summer season concluded, we would use the ladies pool. For privacy, it was an enclosed wooden structure, with wooden slatted sides, some hundreds of yards downstream. I managed to keep having a morning dip until late May, but when it came a matter of walking through the frost I said, “Barley Charlie.” Dad did go right through a winter, he was made of much sterner stuff than his sons were. He used to relate how a chap from Melbourne, used to swimming in the sea at St Kilda, came down to show the yokels how it was done, he dived in and before hitting the water he was on his way back to shore, he said he had never felt water so cold but the explanation is quite simple. The sea has much the same temperature summer or winter, but snow water, makes the rivers so much colder. Spectators and Competitors were used to hold the lane ropes in place! In about 1933 and a pool committee had succeeded in having a new pool built, it was far superior to any thing that had been available prior to then (it provided a safe spot for children to learn to swim, and there was always a person employed to supervise and to the best of my knowledge, I can only remember one lad who drowned there, and he had an epileptic fit. As it was built during the depression, the committee had great difficulty raising funds, but by running different events, they gradually reached a point that the erection of pool and dressing sheds could take place. It had a life span from 1933 to 1969. On the river bank on the other side there was a wooden landing, the distance, 50 yards, so that we could participate in swimming races. The area had the advantage of being at the bottom of a deep bank and sheltered from any southeasterly winds. We used to sun-bake on the Rowing shed Buffalo grass lawn, it was situated to the west of the swimming facility, and it also had a landing that went down to the surface of the water, so they could drop their boats in with minimum effort, it also was a good place to learn to dive. Dad used it to teach pupils by putting a strong belt around their middle with a rope attached so that he could remain on shore with the swimmer supported, until they became confident enough to take off by themselves. Eventually it was superseded by the present Olympic Pool (1969) in Turnball Street. Visiting French swimmers attending a night carnival, at the old pool in 1934 amazed us with their skill just using a kickboard. I did myself disfavour one day in this pool, I decided to duck dive and crashed into the bottom with the old proboscis. The concrete bottom altered the shape of it a bit, I never tried that again. On another memory fund raising effort, a night carnival, a sapling timber tower, some 30 foot high was erected on the river bank, upstream of the Rowing shed landing, petrol was put on the surface of the water, and when it was lit a daredevil dived through the centre of the flames. As this was done at night, in darkness, it was quite spectacular. Anther stunt this bloke performed was to coat him in white paint and adopt all sorts of classical poses, but of course, the fiery stunt was the one that captured attention. It was also interesting to see the illuminated launches in a parade up and down past the looking area. I think that it must have been about 1935, when I gave swimming away mainly because of signs that perhaps things were not as they should be as regards my ticker, such as blue lips and a lack of endurance, Dad suggested that I give it away for a while. Other things took my attention and it was only when my own children came along that my interest was revived. When Sue was about nine, in the early 1960’s I started taking her down to the pool, the then President of the swimming club suggested that might like to join them. Some fourteen years later I gave it all away, because the kids were starting to think of me as a grandfather figure instead of a father one. There is a time to come and there is a time to go. The club like all clubs had its ups and downs and it meant that a lot of folk spent a lot of time and energy and hassles, swimming being a parent and child endeavour it wasn’t always possible to please all of the parents all of the time specially when it came to team selection. 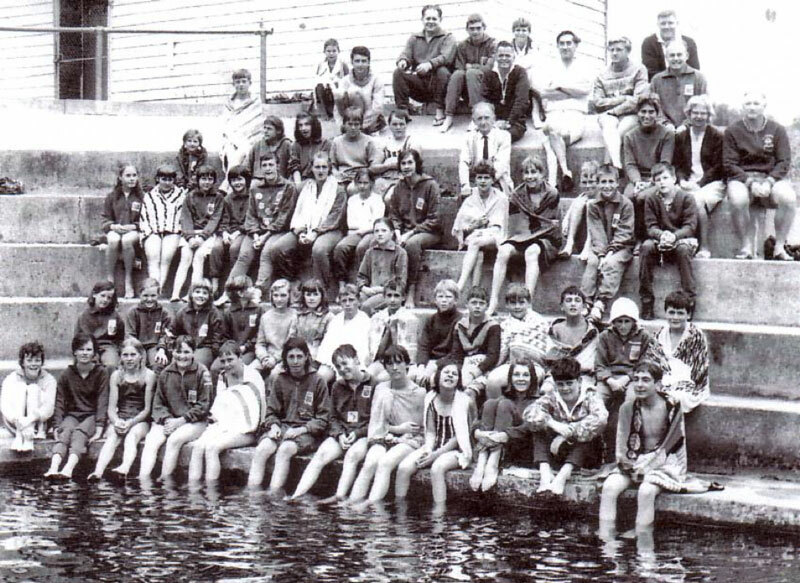 It is very difficult to record all of the events that took place over such a long period or the personalities involved, but out of it all the most rewarding thing to come out of this period was the number of children that were taught to swim and the standard was very good. Every year we ran a coaching clinic with a professional coach, we always had good attendances. The change of venue from the river to the new Olympic Pool in Turnball Street, saw a different attitude. Specially when we had our own club rooms but strange to say after an initial surge of interest there was a decline in numbers. 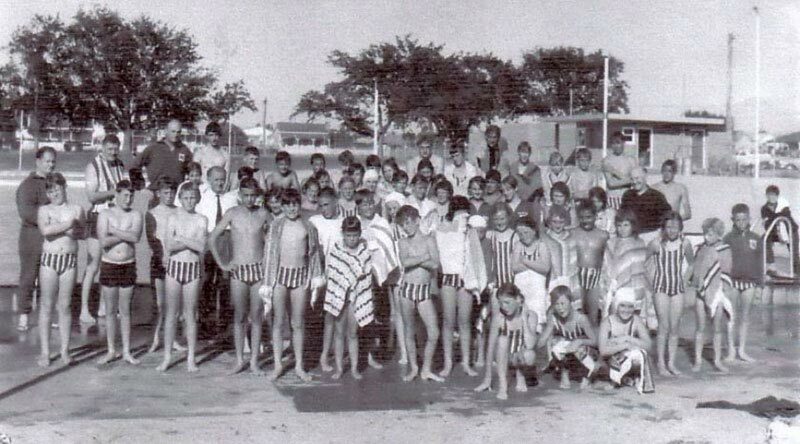 For a number of reasons, daylight savings was one, and pool temperature was another, nowadays of course with a heated pool in McKean street, the Olympic Pool is only used very sparingly, mainly for School sports and hot days. Looking back now, I have no regrets because our three children learned to swim, at a standard well above average. The number of children that were taught over the years reflected the efforts of many people who without any reward were prepared to hop in and help, I was part of and pleased to be, but whether the kids were, let us hope so. I was a member of the Olympic Pool Fund raising committee. As the representative of the Bairnsdale Swimming Club, I found it hard to participate. As I was so involved with the club itself looking back my main contribution would have been in the design of the pool itself I suggested that there be no diving end in the main pool and a toddlers or teaching small pool be incorporated into the overall design. Fortunately, the authorities seemed to be listening because that is how things turned out. The new pool had a bit of a hiccup, shortly after it opened, it was flooded out. Faulty drainage outside the pool itself, after heavy rain, instead of a nice new Olympic Pool, we had a lake. This caused problems later on to the area because once water gets under instead of in the pool; it means trouble to the pool itself. After such a long period of teaching, coaching and participation, many different Presidents and fellow committee persons they saw fit to make me a life member but strange to say I have never been back since I left, because I strongly believe every dog has his day and mine was over. To reflect on the years, there were more plusses than minuses. Like the time one of my pupils, who had been most difficult to teach, because he was completely uncoordinated- When he successfully completed the river swim from the Cut, up near the Wy Yung bridge to the old pool, his father turned to me and said “There we are, that is your reward for all your effort’, and it really gave me a sense of achievement that what I was doing, was good. Life member Bert Matheson pictured at a training session at the new Pool circa 1969.